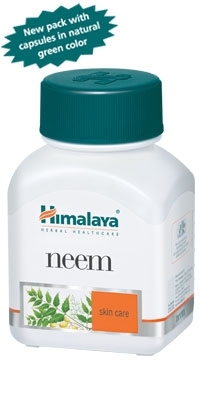 Himalaya Neem is a pure herb extract. The Neem tree is known as Arishtha in Sanskrit meaning 'reliever of sickness'. Neem is a powerful blood purifier and detoxifier and promotes healthy skin and wound healing. Apart from being a general health promoter, neem helps maintain healthy blood sugar levels. Neem's myriad uses led the US National Academy of Sciences, to publish a report entitled 'Neem – a tree for solving global problems'. Neem is nature's systemic purifier, supporting the natural cleansing mechanisms of our skin and internal organs. Neem is one of the most widely used Ayurvedic herbs and is used to detoxify the body. Neem is a bitter tonic herb that clears toxins, while supporting the body's natural inflammation response and its ability to heal wounds. Neem is useful as a tonic and astringent that supports the body's natural wound healing abilities. Neem has detoxifying benefits that help maintain healthy circulatory, digestive, respiratory, and urinary systems. 1 or 2 capsules twice a day with meals. Allow several weeks for long lasting benefits. Natural products have a wholistic effect on the body and take time for absorption and results.